1.) Cut out four, 1 inch circles from the glitter blue paper and apply a snowflake sticker to each one. 2.) Cut out 3//4 inch circles from the white paper and glue on a blue gem. 4.) Start by threading a jingle bell on the string and move it to the center of the necklace. 5.) From here you can have kids choose which item they want to come next and whether or not the necklace will be symmetrical on both sides. Lett kids thread on the straws and the jingle bells. Have an adult help with gluing on the other elements such as the feathers and the circles. 6.) When the necklace is finished tie it in a bow and enjoy. TIP: Please remember that this can be a choking hazard for younger children so they will need to be supervised. If you are looking for some great winter books to enjoy snuggled on your couch with the kiddos these are perfect!! Not good at putting things together?? Here are some great kits that you can buy for your kids to put together.. 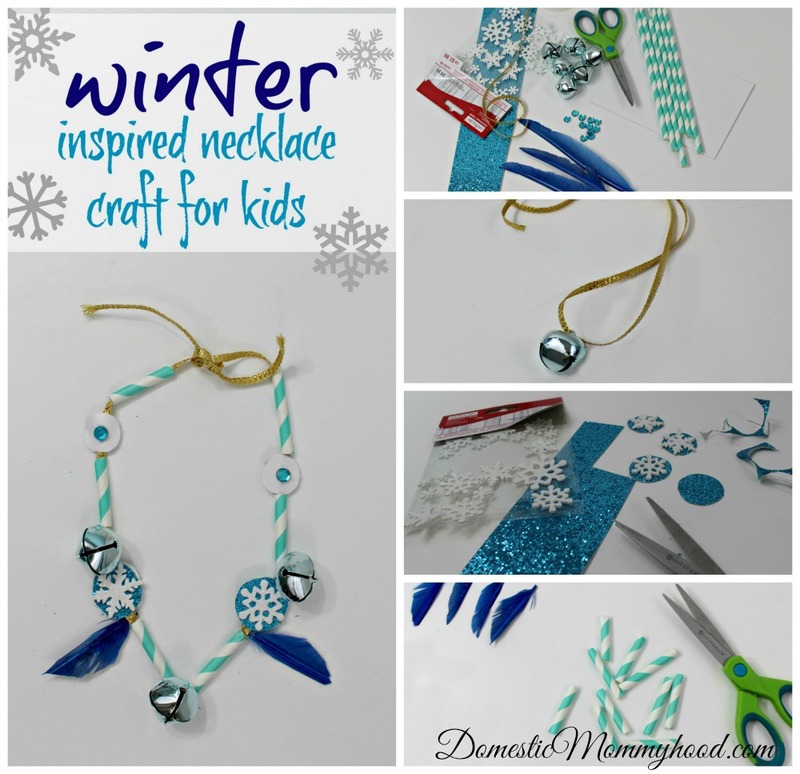 I hope you enjoyed the Winter Inspired Necklace Kids Craft! Drop me a note and let me know what your favorite winter craft for kids is!